"He came back to my room...what ensued was traumatic because a belligerent Alok Nath refused to leave...kept screaming...abusing trying to grab me...but at some point we managed to make him leave." This is the text of a post on the public Facebook page of actor Sandhya Mridul. The Wire has contacted Alok Nath for his response to Mridul’s account and this article will be updated with any reply we receive. At the very start of my career I was shooting a telefilm for zee in Kodaikanal. I was the lead. And very excited. Alok Nath was my on screen father and Reema Lagoo my mother. 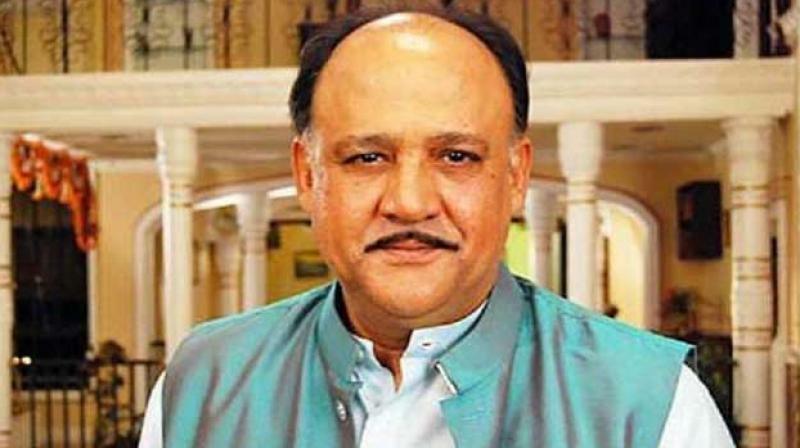 Alok Nath was very impressed with me and called me “god’s own child” and openly praised me everyday. I was over the moon. I was a huge fan of this wonderful Babuji..I felt so fortunate happy and confident. Till one night after an early pack up. The cast went out for dinner. At dinner he got progressively drunk and started insisting I sit with him and that I belonged to him and other stuff that I don’t clearly remember but it made me very nervous and uncomfortable. My co-star realised what was happening and got me out of there. We went back to the hotel without dinner. It was late and I was back in my room and the costume dada came to my room to give me my clothes for the next day as I had a very early call time. A few minutes after he left there was a knock on my door I opened the door thinking it was him again ..it was an inebriated Alok Nath I instinctively tried to shut the door but he pushed it and lunged at me, I stepped aside he went flying past me into the room ..I fell backwards towards the bathroom door he lunged at me again screaming I want you you’re mine ..I dodged again he went into the bathroom and I think I latched the loo door and ran out of my room down the corridor into the lobby. Fortunately my DoP was there making a call from the reception .. He came back to my room what ensued was traumatic because a belligerent Alok Nath refused to leave..kept screaming shouting threatening abusing trying to grab me..but at some point we managed to make him leave. The hairdresser was called and made to sleep in my room I was so shaken up. It didn’t stop there .. every evening he would drink and every night calls were made to my room. I dreaded the ring.. I had to keep it off the hook most of the times. But then he would come calling. It was a catch 22 situation. I had the hairdresser moved in to my room permanently. I was a nervous wreck. Few days later I got very sick & was laid up and couldn’t shoot. The stress had broken me. He continued to traumatise me with calls.And knocks. The hairdresser would answer. One day when he landed up at the door and cried and begged to be allowed in to sodas to me to apologise.. I couldn’t take it anymore I told her to accompany him in..he pulled a chair next to my bed and howled. Said he was an alcoholic and that he had destroyed everything his family his marriage everything’s and I was like his daughter and he respected me and that he was very sorry. He says he had learnt his lesson and that he would go to therapy and change it all.. I finally broke my silence I screamed shouted cried and it was done. I believed him. I had to. He left. He got away. I don’t know how I shot with him for the remaining days and weeks. I’m grateful to my co-actors, my DOP & especially the late Reema Lagoo for finally taking him on & protecting me like a mother from then on. But it was too late. The damage was done. A very disillusioned, disgraced & unsure me returned home. He went on to return to Bombay and tell people I was difficult and arrogant. 1 apologies forgotten. He was a popular man I was a newbie. He laid the foundation others like him built on. All those who heard ‘No’. Attitude my biggest crime. The deal breaker. I stand by you Vinta. What I went through is nothing compared to you. I’m so sorry. More power to you. I’m certain there are others. I urge you to come forward. “Your time is up Sir”. And there was no social media to make ourselves heard, directly. It’s taken me years to lay those demons to rest and move on. I do little work because I do it with people I trust. And those who respect me. My choices. I felt I had two choices then. One, to fight for work or two to preserve my dignity. And stay away from the conflict, the ugliness and embarrassment to me and my family. Which to me meant silence. It’s way different now, they know me so I’m spared. From abuse. And from work. Even though I managed to escape or prevent it somehow and it never reached the point where was assaulted physically. My soul was. My creativity was. My career was. But I stood my ground. As shaky as it got. My bold bindaas badass image comes from there. But nobody wanted to work with “such a woman.” Yes I was told that. On many occasions. I’m happy now women can speak go on social media. So there’s that platform. And it’s pretty powerful. I believe. I have a lot more to say. But it’s been buried so long. I need to dig up what I buried. For that I need more courage and clarity. Yes, some of us need time. To dig into the shame and darkness we’ve buried to be able to work with strength and dignity. I’m work in progress. And where do I begin? So much happened that I can’t remember. And the worst part is I don’t have evidence anymore. Except for me. I’d like to tell all the newcomers that they should use it. Correctly. Honestly. Wisely. Fearlessly. Don’t be ashamed. Let’s keep this fire going.